Representatives of both Apioceridae and Mydidae have been flying since the diversification of angiosperms. Mydidae are known from the Crato Formation of Brazil (near Nova Olinda (07°06'40''S 039°41'59''W), Ceará state) and putative species assigned initially to Apioceridae (Mostovski 1999) and later to Mydidae (Mostovski 2009) are known from Baissa, eastern Russia (Siberia, E of Lake Baikal), and Bon Tsagaan Nuur, Mongolia (45°27'52''N 099°08'21''E). The Crato Formation is estimated to be of Cretaceous: Aptian–Albian age (approximately 112 Million years ago, see The Crato Fossil Beds of Brazil - Window into the Ancient World by D.M. Martill, G. Bechly, & R.F. Loveridge 2007), Baissa is of Cretaceous: Valanginian–Hauterivian age (approximately 132 Million years ago), and Bon Tsagaan Nuur is of Cretaceous: Barremian–Aptian age (approximately 121 Million years ago) (see Mostovski 2009). Photograph of the oldest known Mydidae Cretomydas santanensis Willkommen & Grimaldi, 2007 (Holotype, SMNS) from the Crato Formation of Brazil (approximately 112 myo). Protapiocera megista Ren, 1998: 76 (type species of genus). 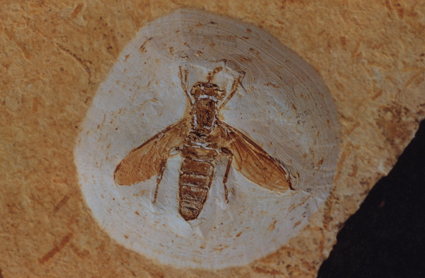 Protapiocera ischyra Ren, 1998: 77. Protapiocera convergens Zhang, Yang, and Ren, 2007: 29. The specimens of all three species originate from the Upper Yixian Formation of Beipiao City, Liaonong Province, China (41°47'31''N 120°46'45''E), which is estimated to be of Jurassic: Tithonian age (approximately 145–150 Million years ago). 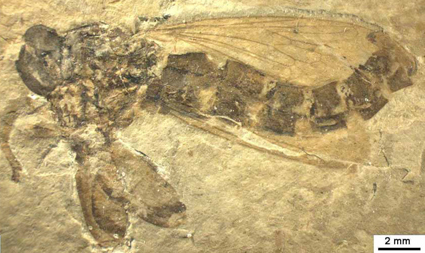 Photograph of a representative of Protapioceridae, Protapiocera convergens Zhang, Yang, and Ren, 2007 (Holotype), from the Upper Yixian Formation of China (approximately 145–150 myo). Photo © Zhang et al. 2007. It is important to highlight that for Mydidae the oldest definitive fossil, Cretomydas santanensis, coincides with the extant distribution of species, but that the putative Apioceridae or Mydidae from Baissa and Bon Tsagaan Nuur and the Protapioceridae fossils from China have been discovered in eastern Asia where flower-loving flies definitely do not occur at present and Mydidae have so far not been recorded.